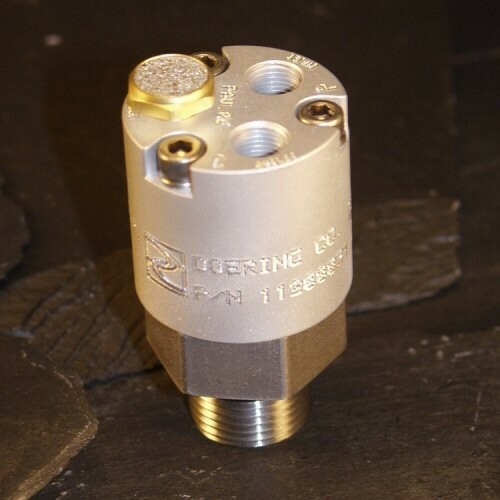 The Doering PAV Series valve provides an interface between Hydraulic or High Pressure (up to 5000 PSI) pilot signal and low pressure 0-150 PSI pneumatic directional control. The PAV Series valves are available with crack pressure ranging from 50 PSI to 2,000 PSI. Call for specific crack and re-seat pressures available. Doering Compny encourages you to call with any application questions. Please see our contact us page. High Pressure Pilot controls Low Pressure Air or Gas. Can be used as a safety or sequence valve.